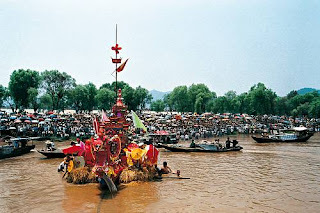 Beginning on the fifth day of the fifth lunar month, people of several ethnic groups throughout China and the world celebrate the Dragon Boat festival, especially in the middle and lower reaches of the Yangtze River. The festivities vary from region to region, but they usually share several features. A memorial ceremony offering sacrifices to a local hero is combined with sporting events such as dragon races, dragon boating and willow shooting; feasts of rice dumplings, eggs and ruby sulphur wine; and folk entertainments including opera, song and unicorn dances. The hero who is celebrated varies by region: the romantic poet Qu Yuan is venerated in Hubei and Hunan Provinces, Wu Zixu (an old man said to have died while slaying a dragon in Guizhou Province) in South China, and Yan Hongwo in Yunnan Province among the Dai community. Participants also ward off evil during the festival by bathing in flower-scented water, wearing five-colour silk, hanging plants such as moxa and calamus over their doors, and pasting paper cut-outs in their windows. The Dragon Boat festival strengthens bonds within families and establishes a harmonious relationship between humanity and nature. It also encourages the expression of imagination and creativity, contributing to a vivid sense of cultural identity.